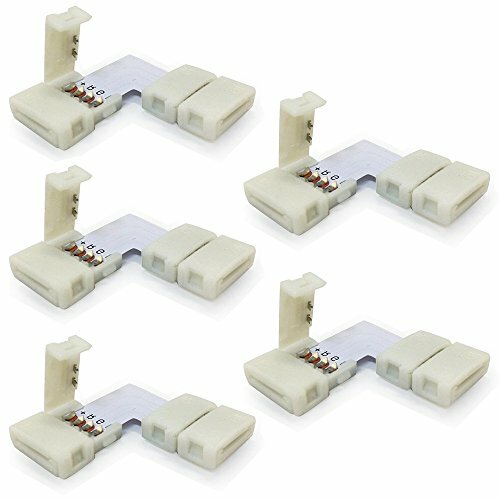 These L shape connectors for RGB multi-Color light strips comes with 2 easy-clasp connectors and a 90 degree L shape PCB board. You can attach it with your light strips directly without any tools or wielding operations. The wireless design ensures seamless layout when you need to spring your light strips around sharp corners. They are compatible with both non-waterproof and waterproof 10mm RGB light strips. Installation tips: Open the cap on the connector and slide in the ribbon. Make sure the poles match correctly, then clasp the cap. For waterproof light strips, you need to peel off the silicone around the soldering line first. Safety Notice To avoid electric shock and burn, turn off the power before cutting and reattaching light strips.